This delicious salad was first introduced to us by Doctor Yum herself in one of her very first project newsletters in 2014. 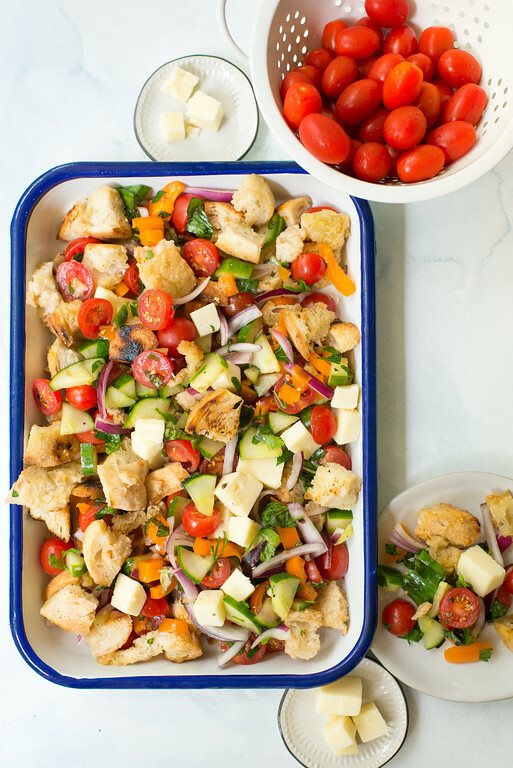 It is a traditional "panzanella" or bread salad, which uses fresh ingredients straight from your summer garden or the farmers market! You can also find these ingredients in the grocery store year-round so you can have a taste of summer anytime. This salad is a perfect side for grilled chicken or fish, but it is also complete enough to be a light meal on its own. It is a very flexible salad, so feel free to add different vegetable ingredients or switch up the flavors by using a different vinegar or another type of cheese, like mozzarella or feta. You could also try different types of crusty bread like ciabatta, cheese bread, or a multigrain loaf. Preheat oven to 375 degrees. Chop bread into 1 inch cubes. In a large bowl, toss bread cubes with 1/3 cup olive oil, 1 teaspoon garlic powder, 1/2 teaspoon salt, and 1/2 teaspoon black pepper. Spread bread on a large baking sheet and put in oven for 20-30 minutes, stirring halfway through, until croutons are lightly browned and crispy. Set aside to cool. In a large bowl, combine tomatoes, cucumber, and bell pepper, and red onion, cheese, basil, and cooled bread. Prepare vinaigrette by adding 1/4 cup vinegar, 1 tablespoon Dijon, 1 tablespoon maple syrup, salt and pepper to a mason jar. Screw on lid and shake vigorously. Add 1/2 cup olive oil and shake again. Dress salad to your liking. Any remaining dressing will keep in the refrigerator for up to a week.